UCLR | Utah Coalition of La Raza is proud to announce the 26th Annual Cesar Chavez Peace & Justice Awards Banquet, the premier Latino-focused awards event of the year. Each year, UCLR honors those Utahns and Utah-based organizations that continue the legacy of Cesar Chavez through their work, their advocacy, and their impact. We’re still accepting nominations for this year’s awardees and will announce the 2019 awardees by the end of February. As always, we look forward to filling our venue with prominent Latino leaders, community partners and allies, and Latino students and activists who will represent our next generation of leaders. This presents a unique opportunity to network, socialize, and connect with prime influencers in Utah’s Latino community. This year’s theme is “In Lak’ech,” a timeless Mayan precept that reminds us of the importance of solidarity, equality, and our shared struggles. As I write this letter, our federal government just ended a partial shutdown over the border wall, we’re learning that the number of family separations at the border was underreported and separations still continue, and the future of DACA remains as uncertain as ever. Our work is nowhere near finished. We hope you'll join UCLR as celebrate Utah's Latino community, honor the memory of Cesar Chavez, award those who continue his legacy, and come together in solidarity for the causes of peace, equality and justice! 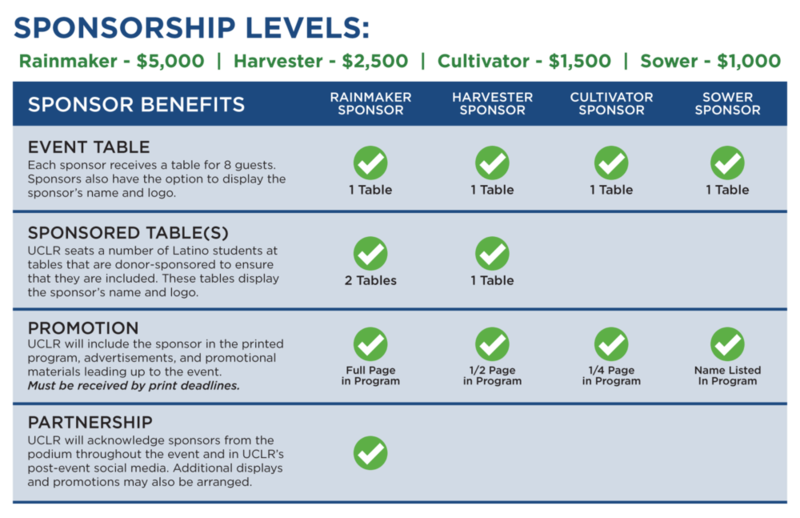 To become a sponsor simply use the form on this page, or contact UCLR’s Board President Richard Jaramillo to arrange to send a check. You can also contact Richard with any questions about sponsorship.